What follows is a rough translation of the interview. 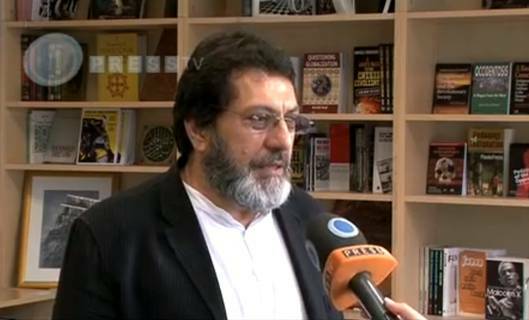 Press TV: Mr. Shadjareh what do you think is hindering unity (among Muslims)? Shadjareh: Well, if we look at the history, the recent history; after the victory of the Islamic Revolution in Iran we suddenly saw a huge outflux of books against Shias and sectarian books. When we look at this and we look at it very clearly it was…, you know, before the revolution there were a handful of books attacking… Shias, after the revolution there was a huge number of these books being published. I remember going to a mosque in London and asking for Quran but, you know, there was no Quran to be found, to be given to us; but there were hundreds and hundreds of these Takfiri books being given freely, right across all the mosques in London and elsewhere around the world. And when you look at the sort of literature coming out of the RAND corporation in the United States and out of the Zionist-run think-tank groups, you will see that they identified it very clearly that the way to stop the way that actually Islam is progressing is to create conflict and to create conflict between Shia and Sunni, to have a conflict between Salafi and Sufi and this is planned to destroy the unity of Muslims. And every Muslim knows that one of the things that is hindering our victory to create a just society for ourselves and everybody else is a lack of unity and this is being planned in the United States and Israel and is being implemented by Saudi Arabia and we saw even in Iraq the way that the insurgency at the beginning was against the US hegemony but that was hijacked by input from Saudi Arabia and the insurgency turned killing Muslims and now we see thousands of Muslims being killed every month in Iraq and this only serves one purpose and that is the purpose of the US and Israel and is being pursued by them and implemented by regional powers like Saudi Arabia. Press TV: Well, Mr. Shadjareh our guest there (Eugene Dabbous) saying that Takfiris are gaining momentum and gaining ground in Syria, in Iraq or elsewhere because there is a lack of any alternative, there is a vacuum. What do you think? Shadjareh: I do not agree with that. I mean the reality is that there is more money being spent on promotion of Takfiris by the Saudis in the last 30 years than any other religious financing anywhere else in the world. The reality is that Takfirism should not be mistaken with (for) radicalism. Takfirism is something which is being designed to create hatred within the family and actually destroy the unity of the family and it really has got not root in Islamic beliefs. You know, this concept of cutting a man open and eating his heart comes from Jahiliah (ignorance). It is not even within the culture of Syria, it is not in the culture of even Iraq. It is a culture of Jahiliah within a specific part of the Saudis’ ugly past of Jahiliah and now it is being Islamicized. So what Hind (an Arab cannibal disbeliever woman) did to Hazrat Hamza (Prophet Mohammad’s uncle) now they are doing to fellow Muslims and they are shouting Allahu Akbar (God is the greatest) and remember that Hid was a Kafar (disbeliever) at the time and, you know, this is being done under the (false) pretence of Islam, deliberately financed and promoted. You know, if we look at… if it is just an issue of injustice and Muslims rising up against injustice, why is it that not even a single one of these so-called Mujahedeen Takfiris has ever gone to Palestine to fight against the Israeli Zionist regime? Not even a single one of them has ever done that. This has been deliberately organized and promoted and really the religious leaders for this are Obama and the Saudis. If Obama does not declare Jihad, these Takfiris would not go on fight, hence we do not see them fighting neither in Kashmir nor in Palestine nor in Myanmar or anywhere else. They only fight where the United States and the Zionist state declares ‘legitimate Jihad’ and we need to understand and separate that from the legitimate sort of grievances that the Muslim Ummah (community) has got because of injustices which are taking place. Press TV: Mr. Shadjareh go ahead. Shadjareh: That is not true (Eugene Dabbous’ comments). This is not true. I mean, to say that the Saudi government is not involved in this is actually becoming almost an ostrich and hiding our head in the sand. The reality is that the huge amount of finance here is coming to these groups, this is not coming from individuals, this is actually Saudi backing, Sheikh Bandar himself is involved in organizing this, you know, this is already exposed and everybody knows about it, but also to say that the Saudis have got the same problem, that is not true. You know, this is orchestrated by, sort of, legitimization of certain so-called Olama in Saudi Arabia, which is unleashed where the West wants it to be unleashed. This is not unleashed everywhere, it is unleashed where the West wants it to be unleashed. It is not unleashed in the Persian Gulf states, because they want to have their harmony but where they want to destroy harmony, when they want to, actually, create havoc, they unleash it there and nowhere else. Press TV: We are quickly running out of time, the concluding remarks Mr. Shadjareh. How responsible do you think Muslims themselves are when it comes to unity? Shadjareh: Well, I remember at the heart of Bosnia affair, I was sitting with Mustafa Ceric, the grand mufti, and we were talking about disunity and he said, and we all agree, that the cause, the reason that Bosnians are being slaughtered, raped, is the issue of lack of unity and then we agreed that they are not allowing us to be united, he turned and said, why are you allowing them to create disunity? And I think to that point we need to go back to our roots and this unity is a must… and we should not allow these Saudi-backed Takfiris to, actually, create disunity and cerate otherness within the family of Islam.